Guitar Center Drum-Off Grand Champion Donald Marple of Keyser, WV gives his winning performance Saturday at the Music Box @ Fonda in Hollywood, CA. 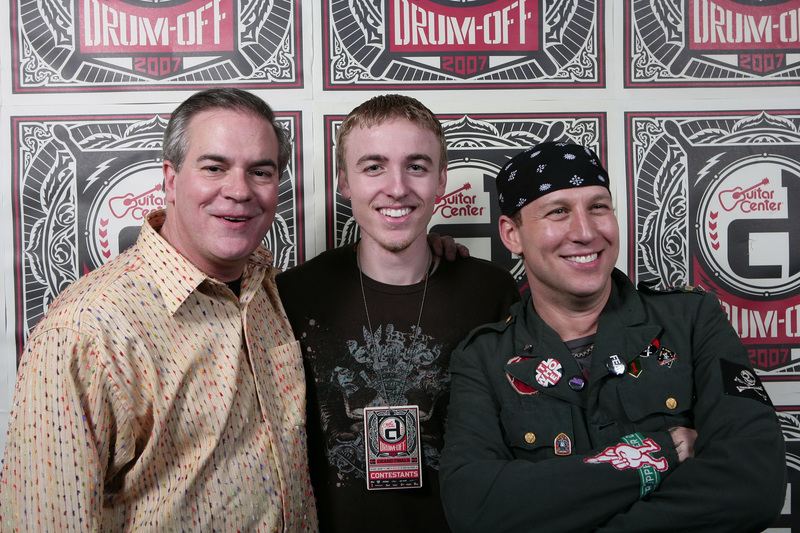 Shown Left to Right: Jay Wanamaker Executive Vice President, General Merchandise Manager, Guitar Center; Drum-Off Champion Donald Marple, and Host/Judge Stephen Perkins (Janes Addiction). Adrian Young (No Doubt), Atom Willard (Angels and Airwaves), Donnie Marple (Drum-Off Grand Champion), Stephen Perkins (Janes Addiction), Byron McMackin (Pennywise), Brooks Wackerman (Bad Religion). Angels and Airwaves performs at Guitar Center’s Drum-Off 2008 Grand Championships at the Music Box @ Fonda in Hollywood, CA. WESTLAKE VILLAGE, CA, January 14, 2008 – Donald Marple of Keyser, WV was crowned the Guitar Center Drum-Off Grand Champion this past Saturday at the Music Box @ Fonda in Hollywood, CA. Playing in front of a packed house, 20-year-old Marple proved he had the skills to be the nation’s greatest undiscovered drummer. He also walked away with a prize package that included a Toyota FJ Cruiser, $10,000 cash, a feature in a Guitar Center ad campaign, a $2,500 Levi’s shopping spree, a custom designed drum kit, a Roland TD20 electronic drum-set, a set of cymbals custom printed with the winner’s signature, a one year drum, cymbal, stick and head endorsement deal, and a write-up in Modern Drummer magazine valued at more than $40,000. After four rounds of intense competition, Marple battled it out with Paul Stoot of Everett, WA, Sherman Arnold of Aurora, CO, and Ivan Garcia from Oglethorpe, GA, to win the title of Drum-Off Grand Champion. Performing a five minute drum solo, Marple impressed the likes of Thomas Lang, Joey Castillo of Queens of the Stone Age, Vinny Appice of Black Sabbath, Ray Luzier of Army of Anyone and Korn, Kenny Aronoff, Alan White of Yes, drummer for Rob Zombie John Tempesta, Steve Smith of Journey and David Garibaldi of Tower of Power, who had the tough job of selecting the winner among the four outstanding Drum-Off finalists. The incredible night, hosted by Stephen Perkins of Jane’s Addiction, featured performances by the four Drum-Off finalists as well as Angels & Airwaves, “Go Get A Late Pass!! !” featuring ?uestlove of The Roots and Nikka Costa, as well as Street Drum Corps with special guests Adrian Young of No Doubt, Brooks Wackerman of Bad Religion, Shannon Leto of 30 Seconds to Mars, John Sawicki of Stomp and Byron McMackin of Pennywise. Steve Smith of Journey and Dave Garibaldi were presented with the Drum Legends Award by Alan White. Also attending the event were Kirsten Dunst, Matt Dallas and Josh Groban, among many others. Drummers across the country began competing this past September at Guitar Center stores. Beginning with preliminaries in over 213 Guitar Center stores, drummers then advanced on from store preliminaries to store finals. Winners of store finals then went on to compete at district finals at 24 Guitar Center stores nationwide for the chance to advance on to four regional competitions with the winner of each of these regions advancing on to compete, this past Saturday, to be crowned the Drum-Off Grand Champion. “Tonight marked a life changing experience for four incredible drummers from across the country,” said Dustin Hinz, Manager Entanglement Marketing, Guitar Center. Guitar Center is proud to provide these amazing drummers with the opportunity to further their careers through showcasing their talent in front of drum legends, industry VIPs and celebrities. 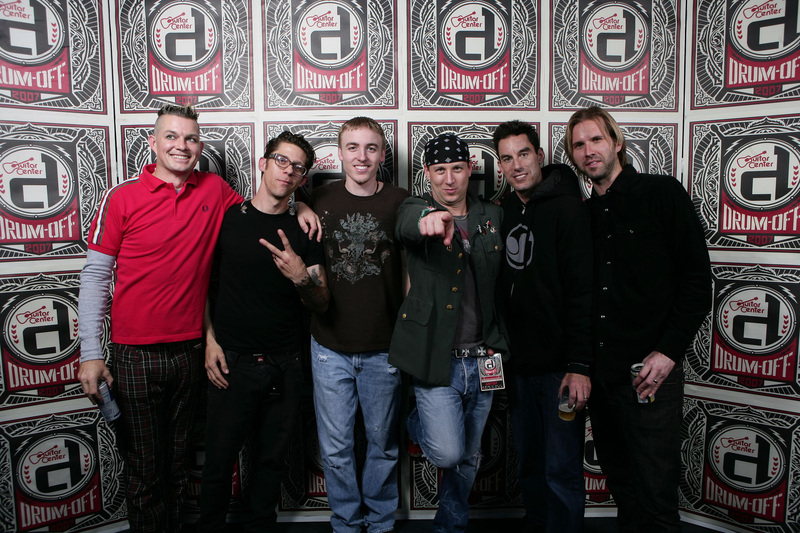 Guitar Center’s Drum-Off represents the core essence of our brand; we are a vehicle to achieve dreams. 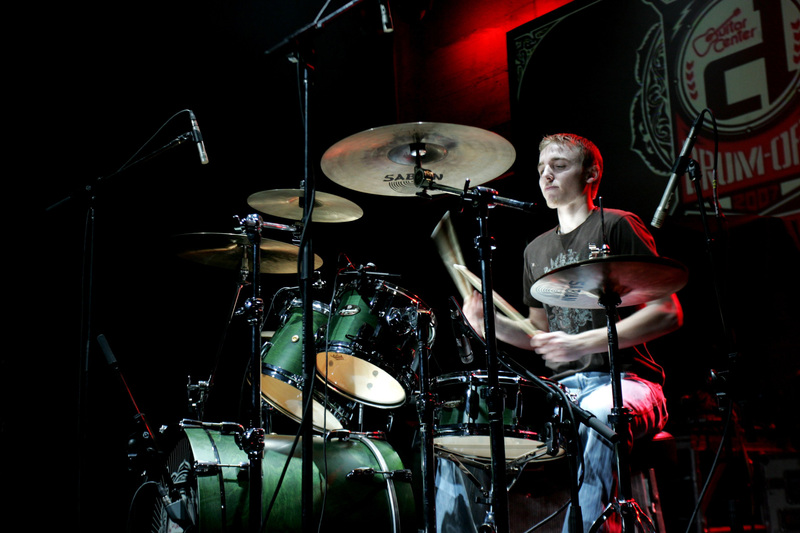 Born and raised in Keyser, WV, 20-year-old Marple began playing the drums at the age of three at his former church, Elk Garden Assembly of God. A high school percussion instructor by day, Marple perfects his talents on the drums in a local Christian rock band, High Pressure. Having never had a drum lesson in his life, Marple’s practice and persistence has paid off with him being crowned Guitar Center’s Drum-Off Grand Champion. Previous Drum-Off winners have gone on to enjoy successful music careers, record albums and tour the world with noteworthy artists. Drum-Off Champion 2002, Cora Coleman, is currently performing with legendary recording artist Prince. Eric Moore II, Drum-Off 2003 Champion, has also achieved notoriety by performing with psychedelic funk band Sly and the Family Stone as well as singer Bobby Brown. Partners for Drum-Off 2007 include: Levi’s, DW, Evans, Vic Firth, Remo, Zildjian, Pearl, Roland, Sabian, Tama, Gretsch, Pro·Mark, and Modern Drummer. Photo Caption: Guitar Center Drum-Off Grand Champion Donald Marple of Keyser, WV gives his winning performance Saturday at the Music Box @ Fonda in Hollywood, CA. 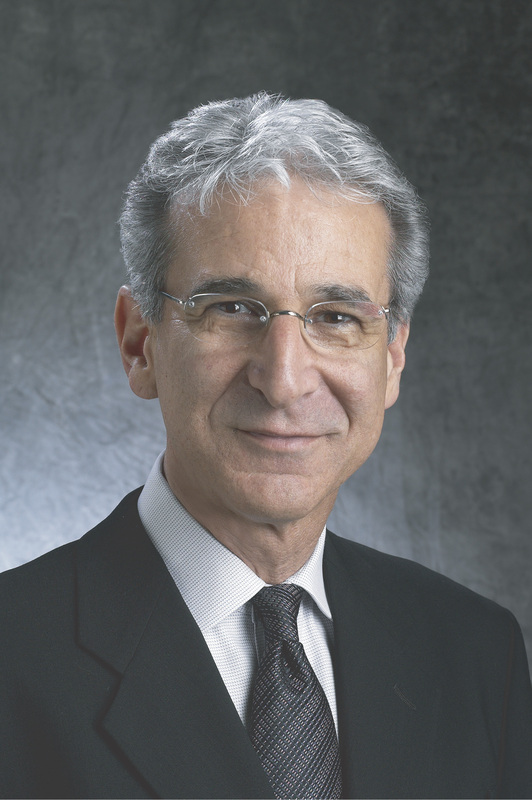 Photo By Robert Knight. Photo Caption: Shown Left to Right: Jay Wanamaker Executive Vice President, General Merchandise Manager, Guitar Center; Drum-Off Champion Donald Marple, and Host/Judge Stephen Perkins (Janes Addiction). Photo By Ryan Hunter. Photo Caption: L to R: Adrian Young (No Doubt), Atom Willard (Angels and Airwaves), Donnie Marple (Drum-Off Grand Champion), Stephen Perkins (Janes Addiction), Byron McMackin (Pennywise), Brooks Wackerman (Bad Religion). Photo By Ryan Hunter. 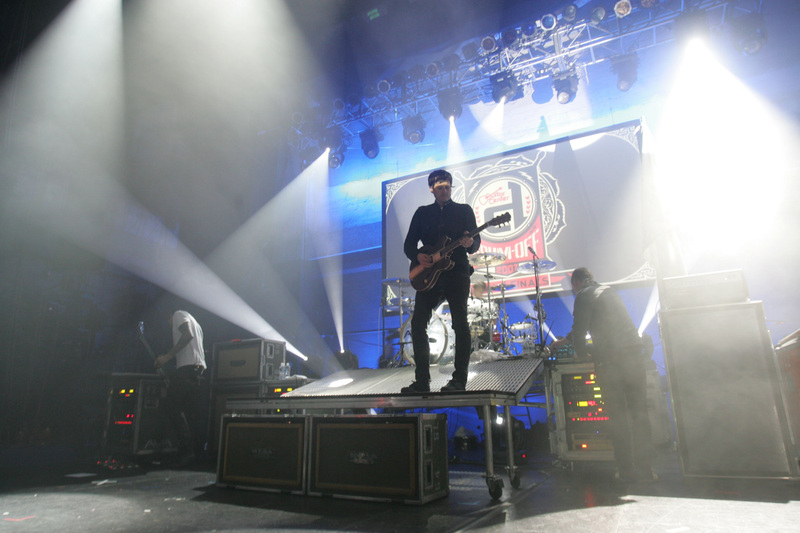 Photo Caption: Angels and Airwaves performs at Guitar Center’s Drum-Off 2008 Grand Championships at the Music Box @ Fonda in Hollywood, CA. Photo By Robert Knight.